There is one thing that always puzzles me – why would Australians eat sandwiches for lunch? To me sandwich is breakfast (just simple cheese or ham and butter on rye) or afternoon snack to tie me over until dinner (polony on white bread with mayo anyone?). Therefore lunch and dinner more often than not will be a cooked meal, usually consisting of some form of starch, meat and vegetables. 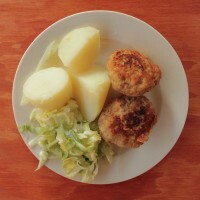 So, let me present to you a quintessential Latvian lunch dish – meatballs (kotletes) served with potatoes and green salad. This recipe of meatballs comes from my grandma, and, as far as I am concerned, they are the best meatballs ever. 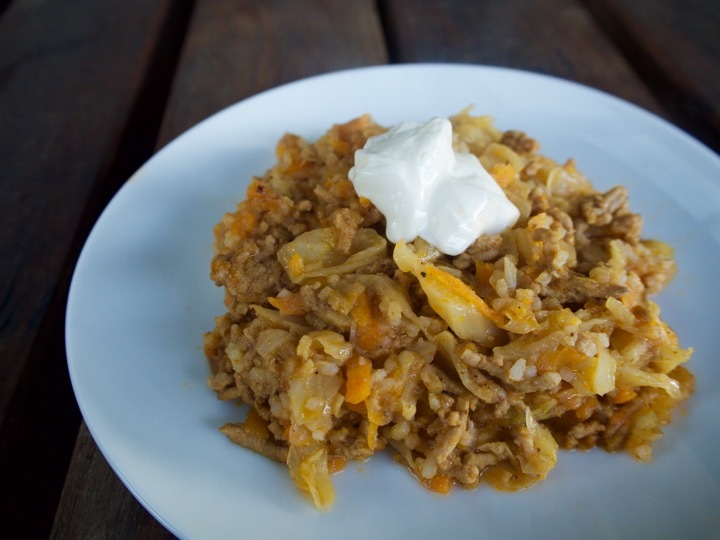 Her secret of deliciousness is hand minced pork loin, dash of sour cream and lots of garlic cooking in the same pan. As with the most things in Latvian cooking, pretty much every family would have a different recipe for meatballs. Some add fried onions, raw minced onions, soaked oats or crumb the balls before frying. 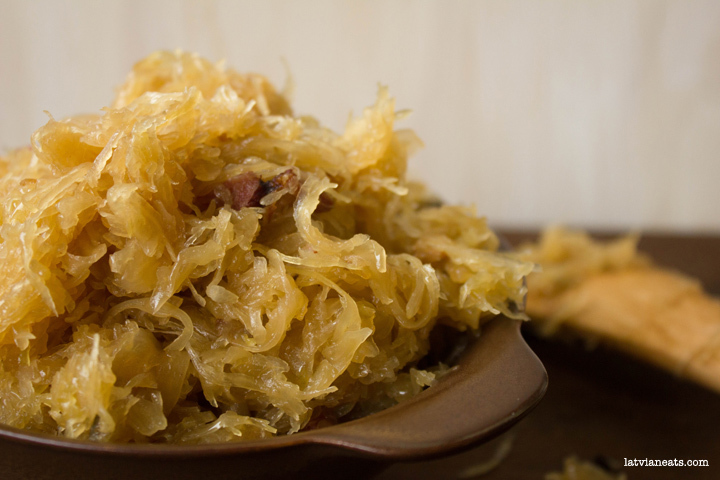 I have tried all of these variations and always come back to the recipe below. 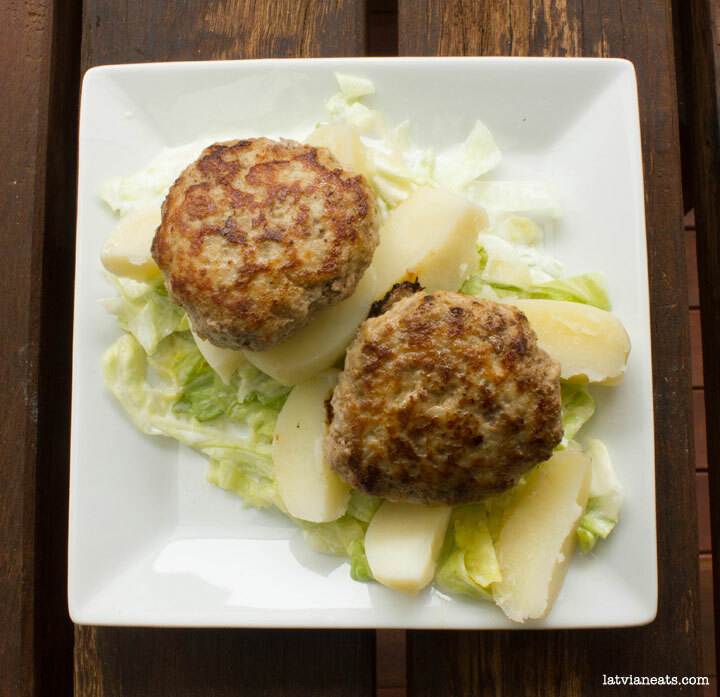 The meatballs are great with potatoes and salad where the buttermilk and cream acts as a sauce, while cold leftover meatballs are delicious on white bread with butter (but I do not get leftover meatballs in my house, kids love them so much). Combine pork, breadcrumbs, egg, sour cream, salt and pepper in a bowl. Roll mince mixture into balls, using around 2 tablespoons of mince mixture for each ball. Heat oil in a frying pan, add meatballs and slightly flatten them with a spatula (or a hand if you are brave enough). Fry the meatballs for around 5 minutes on each side or until cooked through. Thinly slice lettuce, mix with buttermilk and sour cream, season with salt. 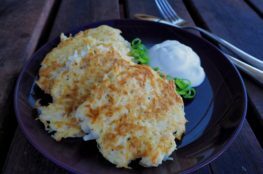 Serve with soft boiled potatoes. I’ve seen turkey kotletes with a carrot sauce in Lido and was wondering how to make that carrot sauce. Anyone have that recipe?